Sometimes simple is best. And because not every dining experience can be fine dining, I'm always on the lookout for a good, casual spot to enjoy an affordable meal. 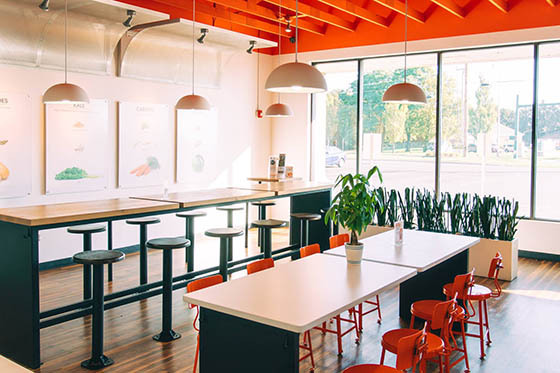 Enter BIBIBOP Asian Grill, a Korean style concept offering healthy, sustainable dishes with an Asian twist. You might think that BIBIBOP is another Chipotle offshoot—because they're often located next to Chipotle—but you'd be wrong. When Chipotle's Shophouse concept went under, the Columbus-chain acquired all the Shophouse closed locations. 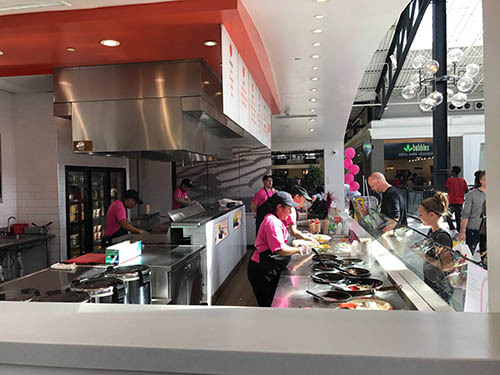 Two completely different entities, BIBIBOP Asian Grill is based on the same model as Chipotle offering build-your-own-bowl type food, but with Korean style influences. Their current locations are near the Beverly Center, Hollywood, Westwood and Santa Monica. At BIBIBOP, the ordering process is simple. Choose your protein— marinated chicken, spicy chicken, steak, or organic tofu. Pick from white rice, salad lettuce, chilled noodles or purple rice. The purple rice is high in fiber and antioxidants and no coloring or dye is added, rather the black rice bleeds into the white making it purple. Choose your warm veggies (potatoes, bean sprouts, beans) and salad toppings (lettuce, corn, sesame kale, daikon, cucumber, carrot, red cabbage, Kimchi, cheese, and eggs). Plus, there's an array of sauces to choose from. 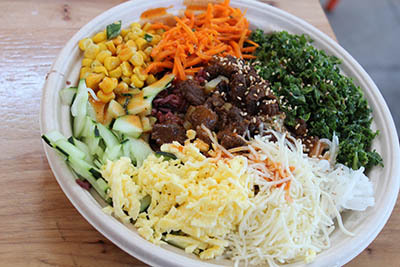 Foodies may already be familiar with the Korean dish Bibimbap, which translates to "mixed rice bowl". At BIBIBOP, they say, "We sought to blend time-honored Asian flavors with classic American favorites to create a dish everyone would love. From the time we opened the doors to our first location, our fresh food and quality service caught on in our community and quickly spread like wildfire. Since then, we've grown to dozens of locations across the nation while maintaining our commitment to bringing Well B-Ing to all the communities in which we set up shop." By Well B-Ing, they mean a happy, healthy lifestyle in every aspect of your life, from vibrant, nutritious food to the feeling of contentment you'll have after your meal. "After dining in one of our restaurants, we want you to leave feeling energized and ready to conquer the rest of your day. Well B-Ing is the foundation for all of the decisions we make at BIBIBOP; if it won't cause you to leave with a smile, we don't believe in it!" When it came time to build my own bowl, I decided to try them all. And funny enough, my favorite bowl was the tofu bowl and I'm a meat eater who isn't crazy about tofu. I wasn't very fond of the chicken and thought the steak was just OK but the tofu was really wonderful and flavorful. 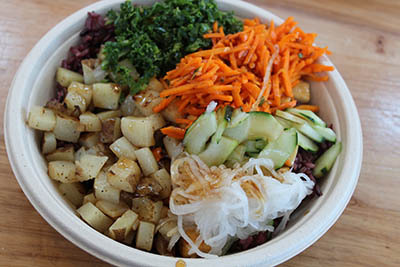 Mixed with the purple noodles, salad and other toppings, the tofu bowl is a great and completely affordable meal. The bowl, which is a fine size is only $6.99 offering you a completely satisfying and delicious meal. 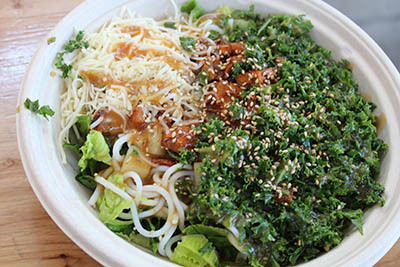 The small tofu bowl, which is also a very adequate size, is just $5.50. The Steak Bowl is the costliest item and it's only $7.99. You definitely get your money's worth at BIBIBOP. There's even free miso soup! This isn't authentic Korean fare by any means, and in L.A., where Korean food is so readily available, you may opt for more bold flavors, but if you're around a BIBIBOP, it's a good option for a fast, casual and affordable meal. And sometimes, that's enough. Click here for all things BIBIBOP.